The Institute for Latino Studies (ILS) is very proud to lead the celebration of National Hispanic Heritage Month at the University of Notre Dame. We have organized a series of lectures, presentations, movies, and cultural events to demonstrate how the entire Notre Dame community is enriched by the work ethic, aspirations, and commitment of Latino students, faculty, and staff who are directly affiliated with Our Lady’s University. 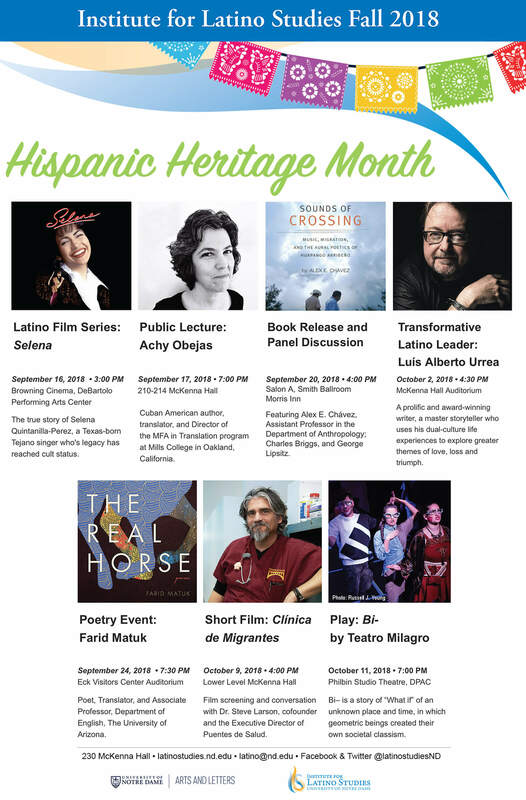 The events organized by ILS during Hispanic Heritage Month 2019 can be found on our website. The origins of a national recognition of Hispanic Heritage Month are with Congressman Edward Roybal (D-CA) who was elected from one of the most multicultural districts in Los Angeles. In 1968 he worked to get President Lyndon Johnson to formally recognize a Hispanic Heritage week where the accomplishments and contributions of Latinos and their families to the U.S. through their high participation rates in military service, commitment to their faith, investment in their children, and ever present willingness to work were recognized. It was, however, during the last year of the presidency of Ronald Reagan that he signed Public Law 100-402 in 1988. The bill was sponsored by Congressman Esteban Torres (D-CA) and as a result the formal designation of Hispanic Heritage Month became a tradition in the U.S. Among the reasons that the four week period of September 15-October 15 was identified for this celebration was because the countries of Costa Rica, El Salvador, Guatemala, Honduras, and Nicaragua celebrate their independence from Spain on September 15. Mexico celebrates its independence from Spain on September 16, Chile on September 18, and Belize on September 21. Latinos now comprise approximately 18% of the U.S. population and they continue to grow in their presence. Approximately 25% of all students enrolled in K-12 schools are Latinos. Of direct importance to Notre Dame is the fact that Latinos now comprise an estimated 35% of all Catholics in the U.S. and have enriched the Catholic Church in many ways. The percentage of all Catholics in California is now estimated at 68% and the Archdiocese with the largest number of Catholics is Los Angeles. The percentage of all Catholics in Texas that is comprised of Latinos is estimated at 72%. These numbers suggest that Latino communities are now and will continue to be major parts of our nation and Catholic Church for generations to come. Interestingly, among the first presence of Catholics in the continental U.S. was in San Augustine, FL. Spanish admiral and explorer Pedro Menéndez de Avilés, founded “San Agustín” in the area that would be called “La Florida,” a place of many flowers, on September 8, 1565. This is fifty-five years before the pilgrims landed in what would become Massachusetts and established the Plymouth Colony. Hispanic Heritage Month allows us to appreciate both the multi-national history of the U.S. and, at the same time, its multicultural future. Originally published by Luis R. Fraga at latinostudies.nd.edu on September 17, 2018.